Ad hoc development to improve the travel experience that allows your customers to access all the booking documentation and travel information or vacation package. It is an ad hoc development tool to improve your travelling experience with this renowned wholesaler specializing in river cruises and circuits. 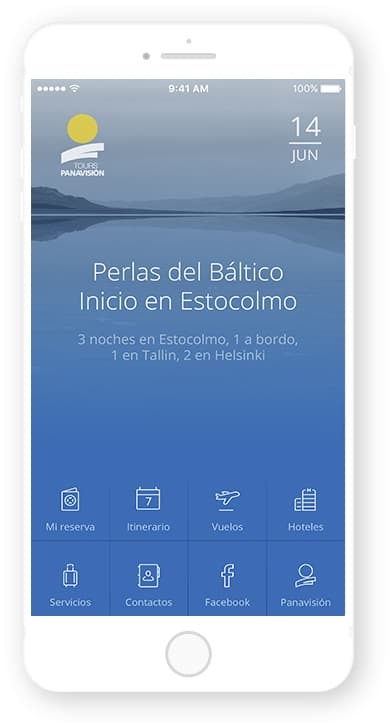 The Panavisión Tours App, technologically supported by their partner Amadeus IT Group, allows their clients to access all the reservation documents and all the trip or holiday package information from their mobile phones or tablets, even when they are offline. Download all the travel documents booked with Panavisión without having to print them. Check the travel itinerary booked with Panavisión Tours, as well as the detailed activities for each day. Access all the details of the hotel reservation, information and location. Directly contact additional services such as transportation through the App’s transfer tool.